Am I being premature? 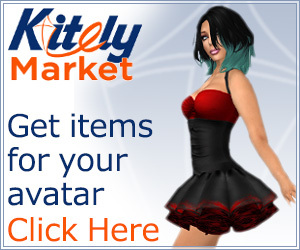 Second Life has outlived its many obituaries. This is not an obit. At the same time, only the most ardent SL-cheerleaders would deny that the virtual world has stagnated. In the case of education, I expect no more than a gradual decline in participation. Other worlds await us, and many of them are linked together and provide content. When I saw a noted artist from SL building in InWorldz, I knew something tectonic had shifted. That is our Philip, quoted by reporter David Kushner. I see two aspects of Linden Lab’s failure. What the talented Mr. Rosedale failed to grasp is that the technology he brought to us was not godlike enough; it disrupted little and, when challenged, its keepers failed to innovate but instead worked harder to sustain a market they’d drawn from The Sims Online players and other early counterparts, then cornered. Had Rosedale a better grasp of industrial history, as Tim Wu has in spades, he’d have seen the difference between what Wu calls disruptive and sustaining technologies. The former destroy whole industries while creating new ones and setting standards: the telephone ended telegraphy. The latter sort of technology continues the dominance of a current system: pricey SUVs kept Detroit in business for a few more years, AT&T Princess Phones hooked teenage girls on an existing technology but did nothing to change the nature of telephony. Something like Skype could, in theory, have ended telephony as we know it. The Internet itself is, unsurprisingly, an inherently disruptive system of technologies. Just ask anyone still working at a record store, book shop, or newspaper. The problem with a system controlled by a monopoly or small group, Wu contends, is that such control can deliberately hinder innovation. Researchers at Bell Labs, AT&T’s research firm, discovered magnetic tape and built a working telephone answering machine in the 1930s. AT&T suppressed this because management feared that recorded conversations might erode confidence in privacy and lead to less use of the telephone network. AT&T, a tethered and regulated monopoly working with the approval of the Federal Government, lacked the vision to see that the innovation, marketed well, might bolster its profits by creating new markets and needs beyond real-time voice. Linden Lab is no AT&T of 1931, or even 2011, but it tried to act that way prematurely. As management changed and OpenSim worlds evolved, offering pricing and features SL could not, however, some early work in interoperability ended. Thus the Lab pulled its version of AT&T’s blunder, but it did so before it had really set a standard: the Lab squashed an innovation from within that it could have dominated and developed. These guys should hire more humanities types, ya think? There are many precedents for customers and industry in such ham-handed actions. In the case of magnetic storage, Wu shows how it came to American shores not from AT&T’s Bell Labs (where it languished in censored research and buried memos) but from German firms. And it came decades later than it might have done. But Linden Lab did not have decades to dominate. In the era of broadband and ADHD media, it had a year. Now OpenSim grids offer interoperability, and we’ll see some clever entrepreneurs develop features such as integrated social media, robust functionality on mobile devices, and an inter-grid marketplace. 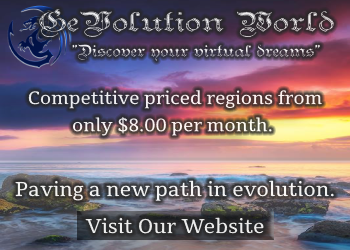 So instead of becoming disruptive, Second Life’s new features were sustaining their temporary monopoly, with even voice offering little that a Skype connection could not. Web-on-a-prim should have come years earlier, and it would have constituted a real step toward a “3D Internet,” a promise of Rosedale’s early and Apollonian days in SL. The same is true of the Lab’s failure to make the Linden Dollar and SL Marketplace the de facto standards for all SL-derived worlds. Linden Lab once had the market position and, key point, media spotlight to convince content-creators to license products for multiple grids. It also had enough respect for its currency to offer Linden exchanges outside of SL’s grid. The lack of such a marketplace and currency-of-choice is temporary. Thomas Parke Hughes, an historian known for his scholarship on the rise of the electrical networks, refers to such obstacles to technological progress as a “reverse salients.” These may hinder forward moment much as a stubborn fortress might in an army’s line of march. Eventually, they are overcome, like Constantinople’s walls, or bypassed, like the Maginot Line. I see no reason why, given the financial incentives for building an inter-grid market, that this salient won’t vanish like most others in the history of technology. This could have been an easy win for Linden Lab. But in both the case of interoperability and commerce, the Lab did not act. Instead they made the garden-wall around SL taller and thicker. I am no insider to LL boardroom politics even third-hand, but I sense a failure of vision and a desire to stick to Rosedale’s Snow Crash ideal of making one big Grid, not a constellation of grids with a common currency, marketplace, and means of transportation. We educators will live amid and build upon the rubble of the Lindens’ failed vision. A virtual world with rich integration of Web resources would indeed be disruptive. Imagine an SL with a Unity-style client having been launched in 2007. Imagine the client bundled in every release of Firefox. We might meet mom and pop via our browser do more than exchange photos or status updates. If it were easy enough to use, we’d convene to race Formula-One cars we designed ourselves, or we’d play volleyball. In theory and with a better physics engine, SL had that potential. Such environments could, for instance, replace current social networking. There are advantages to embodiment online, since we are wired as biological entities to react to other people in certain ways one does not see in the 2D world of a teleconference. And I’m not just talking about cybersex. A 3D Web experience could lead to, say, Amazon’s online bookstore yielding to a 3D one where virtual books could be perused as easily as one scrolls through an iPad or Kindle. 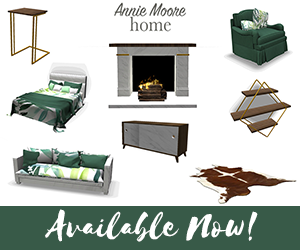 As one browsed, reviews could be checked with a click to invoke a virtual copy, fellow customers chatted up real-time about their picks, and more. Second Life would be about selling the experience of buying books, not just making a fake version of a bookshop rezz online. Want to see what the IKEA chair looks like, Tyler Durden, in your swank living room? Put this IggyO Industries™ RLRezzer™ on the floor, then from your iPad’s Metaverse-Hopper app, click on the items your avatar just tried out in Second Life™. Don’t forget that you cannot sit on the hologram! Paypal™ and InterGridBux™ accepted! 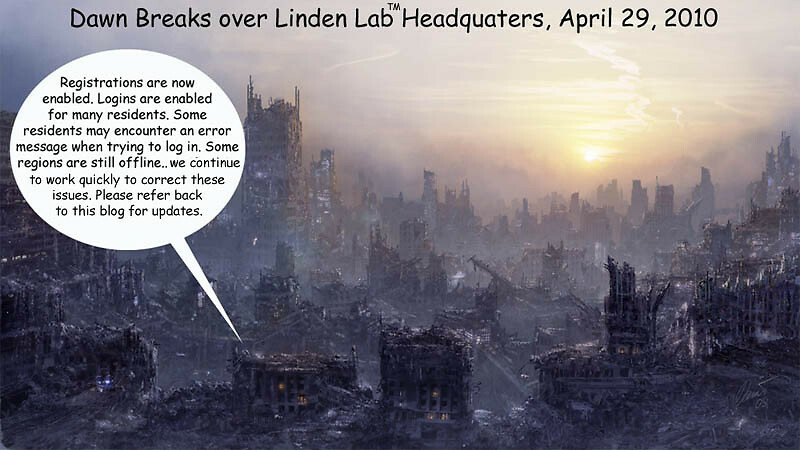 Back to actual 2011 a.d.: Linden Lab failed because it did not think far enough outside the prim. Will we ever get a 3D Web? Unlike routine vacations to lunar hotels, where the incentive may exist, the costs are not prohibitive and the infrastructure exists. I presume the Net Neutrality will continue and companies like Verizon and Comcast will be constrained, under FCC principles for Common Carriers, to act according. If not, other nations with more enlightened policies may build the next Internet. Like the Interstate system, it will transform daily life (and not in always wonderful ways). Whoever builds a 3D Web, I doubt that Linden Lab will be more than an historical footnote in e-texts about the next era of information technology. The hour is past for them. Today I demo’ed our OpenSim build of House of Usher to the folks from our Digital Scholarship Lab. All went well with lag, rezzing, scripts, etc. When I mentioned that our campus has left SL, however, I got a telling reply from one senior technologist.